The flexible and easy to use Gigabit Ethernet SFP media converters are the most versatile media converters in the world. Models support Industrial, IT, and commercial applications. The EIR-G-SFP can be din-rail or panel mounting. 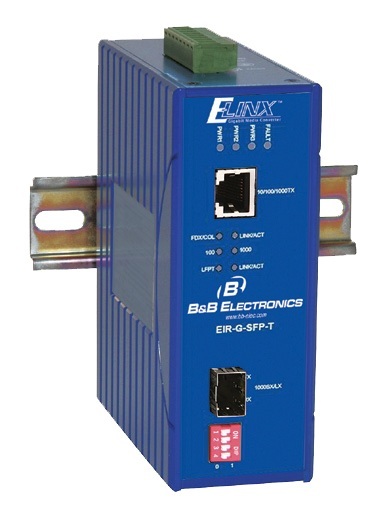 The EIS-G-SFP can be used on desktop, wall mountable and can be used with an optional 19″ rack mountable chassis that holds up to 16 units for central control purposes. The converters feature easy to understand diagnostic LEDs. These LEDs show details for Link, Transmit/Receive, Full/Half duplex, and power status. – SFP socket for Gigabit fiber optic expansion. – Full wire-speed forwarding rate. – EIS-RACK-16 chassis system compatible.